King of Aragon (1336-87). During the whole of his long reign he showed himself just toward the Jews in his state, and more gracious than any of his predecessors. 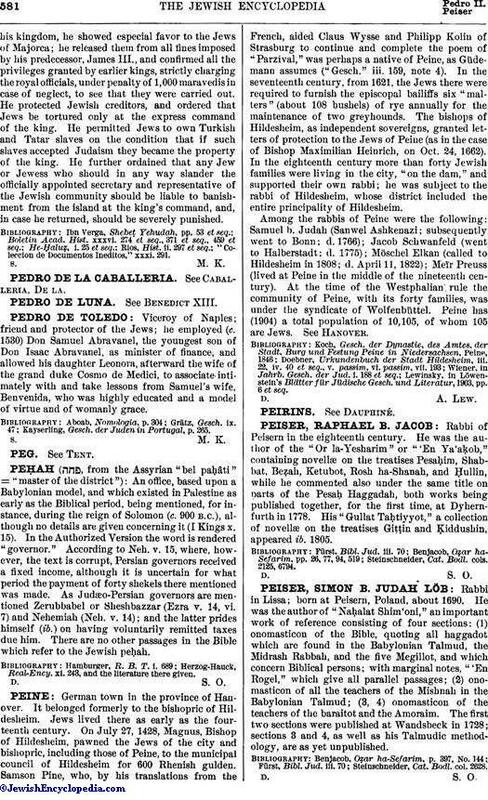 He had a Jewish body-physician, Rabbi Menahem, whose pupil in astrology he professed to be. He is probably identical with the Pedro who is called "Pedro the Old" in Jewish chronicles and who had a conversation with the learned Jew-baiter Nicolas de Valencia. When Nicolas declared that all he said of the Jews he had heard from a Jew converted to Christianity, the king characteristically answered: "One can not believe such a person, because it is easy for any one who changes his religion to change his words also." And when Nicolas advised him to subject the Jews to his religion by force the king said: "I have never seen good results from anything that happened through compulsion." 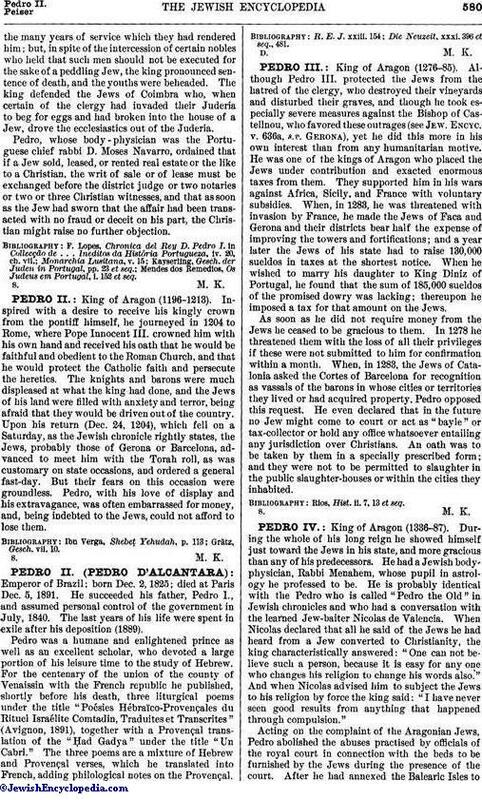 Acting on the complaint of the Aragonian Jews, Pedro abolished the abuses practised by officials of the royal court in connection with the beds to be furnished by the Jews during the presence of the court. After he had annexed the Balearic Isles tohis kingdom, he showed especial favor to the Jews of Majorca; he released them from all fines imposed by his predecessor, James III., and confirmed all the privileges granted by earlier kings, strictly charging the royal officials, under penalty of 1,000 maravedis in case of neglect, to see that they were carried out. He protected Jewish creditors, and ordered that Jews be tortured only at the express command of the king. He permitted Jews to own Turkish and Tatar slaves on the condition that if such slaves accepted Judaism they became the property of the king. He further ordained that any Jew or Jewess who should in any way slander the officially appointed secretary and representative of the Jewish community should be liable to banishment from the island at the king's command, and, in case he returned, should be severely punished. "Coleccion de Documentos Ineditos," xxxi. 291.